Love is the story of Vibeke and Jon, a mother and son who have just moved to a small place in the north of Norway. It's the day before Jon's birthday, and a travelling carnival has come to the village. Jon goes out to sell lottery tickets for his sports club, and Vibeke is going to the library. From here on we follow the two individuals on their separate journeys through a cold winter's night - while a sense of uneasiness grows. Love illustrates how language builds its own reality, and thus how mother and son can live in completely separate worlds. This distance is found not only between human beings, but also within each individual. This novel shows how such distance may have fatal consequences. With the publication of the novel CUT in 1994, Hanne Ørstavik (b. 1969) embarked on a career that would make her one of the most remarkable and admired authors in Norwegian contemporary literature. 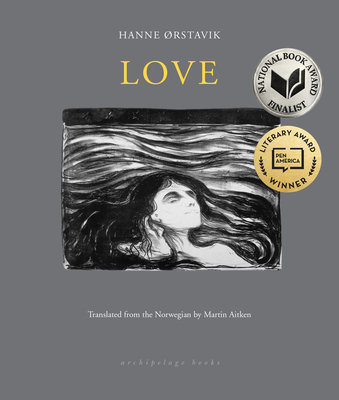 Her literary breakthrough came three years later with the publication of LOVE (Kjærlighet), which in 2006 was voted the 6th best Norwegian book of the last 25 years in a prestigious contest in Dagbladet. Since then the author has written several acclaimed and much discussed novels and received a host of literary prizes. About the Translator: Martin Aitken is the acclaimed translator of numerous novels from Danish and Norwegian, including works by Karl Ove Knausgaard, Peter Høeg, Jussi Adler-Olsen, and Pia Juul, and his translations of short stories and poetry have appeared in many literary journals and magazines. In 2012 he was awarded the American-Scandinavian Foundation's Nadia Christensen Translation Prize.